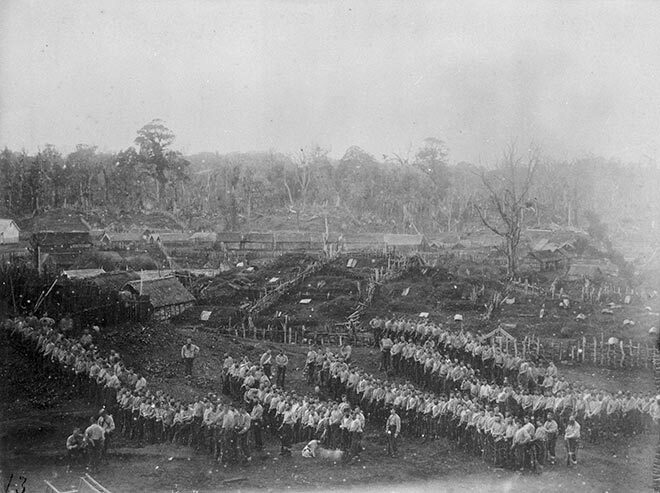 Armed constabulary prepare to advance on Parihaka in late 1881, part of a combined force of more than 1,500. On 5 November the forces surrounded the township and arrested passive-resistance leaders Te Whiti-o-Rongomai and Tohu Kākahi. Over the next few weeks many of the residents were evicted and their houses destroyed. The two chiefs were given an enforced tour of the South Island, designed to demonstrate the advantages and power of Pākehā society. They were returned to Parihaka in 1883. After many years of decline the village of Parihaka was rejuvenated in the late 20th century. From 2006 it was the venue for the annual Parihaka Peace Festival, which drew visitors from all over New Zealand.